Israel Folau has become Super Rugby's joint-record try scorer after dotting down against the Crusaders on Saturday. The Waratahs and Australia star equalled the haul of 59 set by Doug Howlett as he was presented with the simple task of pouncing on a loose ball after the Crusaders failed to deal with a cross-field kick into the in-goal area. 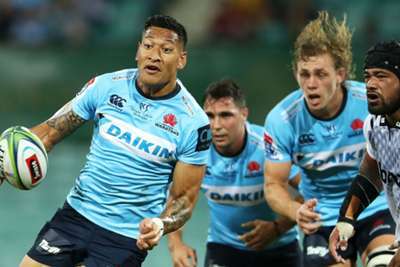 Howlett set that benchmark in spells with the Highlanders, the Hurricanes and the Blues, whereas all of Folau's tries have come for the Waratahs, with whom he made his Super Rugby debut in 2013. Folau is the Wallabies' joint-third highest try scorer, having crossed 37 times for his country. He needs four more to move second on the list behind David Campese (64). His try helped the Waratahs hand the Crusaders their first defeat of the season, prevailing 20-12 at the Sydney Cricket Ground.